Best Flights to Venice Italy, all summarized! Flight from New York Newark to Venice Airport (VCE) with United Airlines! Flying the beginning of May until the beginning of October 1 time a day. Flight from Philadelphia to Venice Airport (VCE) with American Airlines! Flying the end of April until the end of October 1 time a day. Flight from Southend to Venice Airport (VCE) with EasyJet! Flying the mid of April until the end of October several times a week. Flight from Newcastle to Venice Airport (VCE) with Titan Airways! Flying June until August 1 time a week. Flight from London Luton to Venice Airport (VCE) with EasyJet! Flying March until October serval times a week. Flight from London Heathrow to Venice Airport (VCE) with British Airways! Flying March until November every day. Flight from London City Al to Venice Airport (VCE) with British Airways! Flying several times, a week. Flight from Leeds to Venice Airport (VCE) with Jet2.com! Flying 2 times, a week. Flight from Birmingham to Venice Airport (VCE) with Monarch, Thomsonfly or Titan Airways! Flying several times, a week. Flight from Bristol to Venice Airport (VCE) with EasJet! Flying several times, a week. Flight from Edinburgh to Venice Airport (VCE) with EasJet or Jet2.com! Flying several times, a week. Flight from Glasgow to Venice Airport (VCE) with Jet2.com or British Airways! Flying several times, a week. Flight from Dublin to Venice Airport (VCE) with Aer Lingus! Flying the end of March until the end of October several times a week. Certainly, when you are in the UK, you can get cheap flights to Venice. I had a flight from London to Venice several years ago. I was landing at Treviso Airport with Ryanair. My low budget airline had to use this airport, since Marco Polo Airport is the more expensive and international airport in the Venice region. Treviso Airport is small with the greatest disadvantage that is it is 21 miles from Venice. The only useful transportation to Venice are the ATVO shuttle buses. If you are flying from the United States and all above mentioned flights, you will certainly arrive at Marco Polo Airport, Venice Airport (VCE). This is more convenient because it’s only 5 miles from Venice. 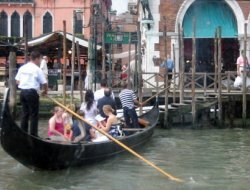 And there are easy transports to reach your hotel in Venice. On my page ‘from Airport to Venice’ you can read everything on how you will reach Venice from both airports. Once in Venice, go enjoy all the beautiful sights. Experience the culture of Venice and you have a vacation you will not soon forget. Flights are available for online booking. You can easily spend a weekend in Venice if you are from the UK. When you are from the USA, you probably want to combine your visit to Venice with another Italian city or European city. Everyone wants to fly cheaply. With a good comparison website, you save a lot of money. Save and compare your airline tickets. Find cheap flights to Venice! Compare over 400 airlines and find a great flight to Venice today. When I book my ticket to Venice, I always use a comparison site. You've read about the best options to Fly to Venice Italy. There is plenty to explore. 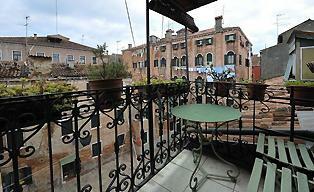 Read my site on Venice and get more information about this beautiful Italian city.